One of our members setup an IKEA Lack coffee table server rack. 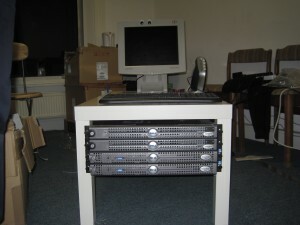 Here it is housing TOG and members servers. This was written by schrodinger. Posted on Monday, February 8, 2010, at 10:22 am. Filed under Project. Bookmark the permalink. Follow comments here with the RSS feed. Post a comment or leave a trackback. Hey great idea! I am definitely going to make one of these racks. Remember reading about the famous IKEA tables with perfect 19″ leg spacing that made them perfect for this sort of thing. How’s the heat on the servers since it dosn’t look like there is any air circulation around the servers them selves?